Do you have a super picky eater? One who would rather not eat than risk a bite of vegetable? A child who refuses to touch real meat, but will happily munch on chicken nuggets all day long? Just about every mom deals with picky eating at some point. Some kids are just like that and, contrary to popular belief, it’s not bad parenting that causes it. Even kids who have only ever been exposed to healthy food can end up only eating a handful of options for months or even years. Frozen vegetables: Frozen peas and corn are a novelty for children who might not normally enjoy vegetables. As a child, I munched on these all the time. They’re just as healthy as fresh and the cold makes them more appealing. Serve just a few at a time to avoid them thawing. Avocado bites: Cut a barely ripe avocado into small squares. If you want to make it even more fun, try sticking a toothpick or plastic drink sword into each cube. Avocadoes have plenty of healthy fat, too. Zoodles: Use a spiralizer to turn carrots and zucchini into tasty noodles that you can steam and serve as is or with tomato sauce. Shaved vegetables: Use a potato peeler to shave off thin slices of carrot, cucumber and other veggies. These paper thin shavings can be more appealing to children than chunks of the vegetables. Steamed vegetables: Cut broccoli, cauliflower and similar veggies into small cubes and steam until just tender. These can be served as is, or you may sprinkle them with a little salt. 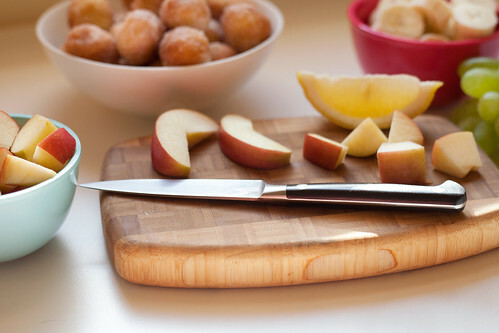 Chopped fruit: Slices of strawberries, banana, apple, pear, and kiwi can all be good snacks. If your child isn’t interested in eating them, you can always add a dip made of yogurt and cinnamon with a little honey mixed in. Dipping makes everything fun! Baked potatoes: Do your kids love fries? Give them a healthy alternative by slicing boiled potatoes, brushing with olive oil and baking in a 350° oven until golden. Chill and serve with ketchup. Fried vegetables: While these aren’t super healthy, they will get your picky eaters trying new foods. Heat some oil and cut vegetables into long, thin strips. Eggplant, zucchini, and similar vegetables work very well. Dip in beaten egg and then in flour with a bit of salt and pepper mixed in. Drop carefully into the hot oil and fry until golden brown. Drain and cool a bit before serving. Sweet potato cubes: Bake a sweet potato until cooked through, then peel and cut into cubes. Your little one will likely eat it just like this, but if they need more convincing, you can cook the cubes like hashbrowns before serving. Garlic green beans: Steam a cup of green beans, trimmed to one or two inches, until tender. Chop up some garlic and heat in a little olive oil. Add the beans and cook until they just start to brown. Toss with the oil and serve hot or cold. Freeze-dried fruits: The unique texture of freeze-dried fruits and berries, plus their sweetness, may get past your child’s pickiness. It’s worth a try! You can find a wide assortment here. Fruitcicles: Make your own fruity popsicles that are crazy healthy. I use the Zoku Quick Pop Maker to make almost instant popsicles, but you can easily just freeze in ice cube trays or cups. Blend fruit with a little coconut milk, juice or yogurt and pour into your molds. Add a popsicle stick and freeze until hard. Mini pancakes and waffles: Do your children tend to turn up their noses at the full size waffles and pancakes? They’ll be more likely to eat the mini options. If you don’t want to make your own, just cut the regular waffles into narrow strips, or use a biscuit cutter to cut rounds out of pancakes and make mini ones. Serve with yogurt for dipping. Banana oat cookies: Mash one banana with an equal amount of quick oats until well blended. Heat the oven to 350° and drop spoonfuls of the mixture onto a baking sheet covered with parchment paper. Bake for 10-15 minutes or until cooked through. Toast triangles: Simple, yet healthy if you choose the right bread, these tiny snacks will please your little one’s palate. Just toast a piece of bread and cut into quarters, then cut each quarter into halfs to make small triangles of toast. Serve plain or with butter or peanut butter. Mini muffins: Take any muffin recipe and use a mini muffin tin (like this one) to make adorable little muffins that your child won’t be able to resist. Seeds/nuts: Serve a little container (we love these bento containers) filled with sunflower seeds or chopped walnuts, almonds or other nuts. Toasted almonds: Get some almond slices and toast them in a pan before giving them to your picky eaters. The extra crunch makes them more exciting to eat. Beans: Rinse a few different colors of beans and arrange them on a plate in small amounts, five or six of each bean. Black beans, kidney beans, chickpeas and cannolli beans are all fun to try. DIY fish sticks: Making your own fish sticks is super simple and far better than the chemical laden options from the store. This recipe can be made fresh or frozen for those days when you don’t have as much patience. Peanut butter balls: Mix 1 cup of peanut butter with 1 cup of powdered milk and add honey to taste. Mix with your hands until smooth. Roll out little balls for your kids to eat or let them mold it like clay and eat it. Chickpea patties: Rinse a cup of chickpeas and toss into the food processor, along with a handful of parsley, a garlic clove, some salt and paprika, as well as any veggies you feel like . . . I use spinach, carrots and cauliflower. Blend until almost smooth and stir in flour or oatmeal. Shape into little patties or fingers and cook in a pan with hot oil until crisp and golden on the outside. Not all kids will like these, but if your kiddos will accept them instead of chicken nuggets (mine are frequently fooled), they make a healthier option. Chicken bits: Boil or steam chicken breast with a little salt and herbs to flavor. Cut into cubes and serve as is. Ground beef chunks: In a pan, cook 1/2 lb. lean ground beef until browned, along with seasonings as needed. Break the beef into half inch pieces and serve your child once cooled. Cheese cubes: Little cubes of cheese, cheddar, mozzarella, or similar is fun to eat. If your child is particularly picky, try offering shredded cheese . . . it’s pretty hard to resist! 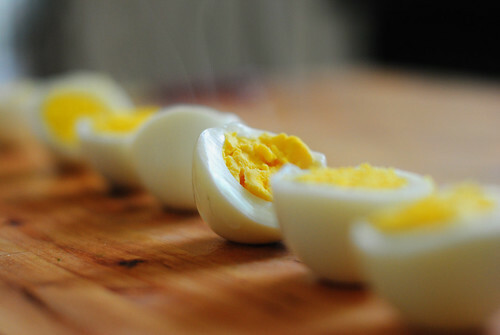 Boiled eggs: Keep a few hardboiled eggs in the friedge and simple chop them up for snacks. Your picky eaters may prefer the white or the yolk, but continue offering both, though separately. Chicken nuggets: Making your own chicken nuggets is easier than you think, and so much healthier. Smash some cornflakes on a plate and in a bowl, beat an egg. Cut chicken breast into small chunks and dip in the egg, then in the cornflakes. Fry in a pan with a little oil until golden, turning frequently. Check to make sure the chicken is cooked through, then serve with ketchup or another favorite dip. Scrambled eggs: Beat an egg with a teaspoon of milk and scramble in a hot pan. Allow to cool before serving a few pieces on a plate or in a muffin tin. Picky eaters will often enjoy this when they would normally only eat one part of the egg if it were boiled. The trick to serving healthy snacks to picky eaters is not to overwhelm your child. Give small amounts of food. You can always offer more later on. Provide food throughout the day and don’t worry if your little one is eating just a few items each time. If there’s anything that causes concern, take your child to the doctor or a nutritionist.